On 22 may 2015, 7 student activists from the faculty of Law, Khonkhean University under the name "Dao Din Group" gathered at the Democracy Monument in Khonkhean and hold a banner to oppose the coup in an occasion of coup anniversary. They were all arrested and informed of charge under Order of the Head of NCPO no. 3/2015. After bail was granted, they declared civil disobedience and did not report under the warrant. Later, Jatupat, one of the accused, was arreset under lese majeste charge and was taken to be tried under this case. While other 6 are still not report. The 7 Dao Din activists were charged of defying the Head of NCPO Order no.3/2015 for showing an anti-coup banner at Democracy Monument in Khon Kaen on 22 May 2015. 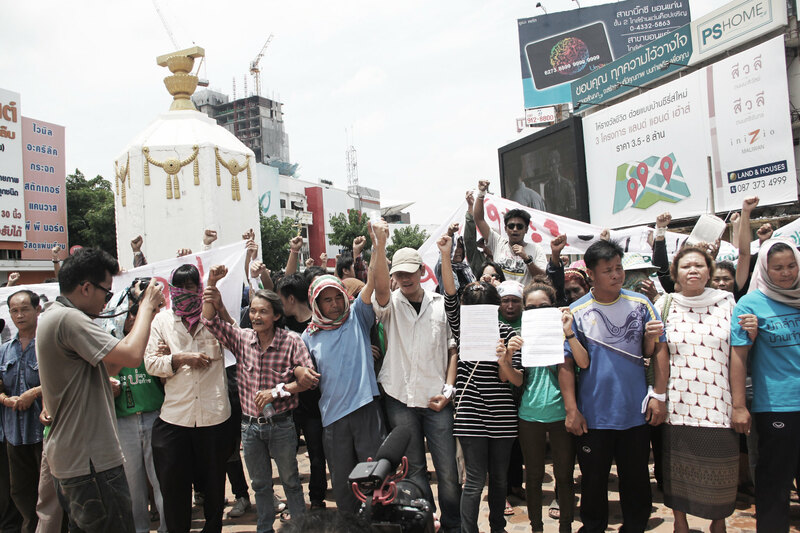 On 22 May 2015, at the Democracy Monument in Khon Kaen, 7 student activists from the Dao Din Group were gathering as a symbol to oppose the coup, police and military officers came to arrest them at 13.27 pm. During an arrest, one of the officers said “please come with us willingly unless there will be higher methids”. After that 7 student activists were bought to The 23rd Military Circle HQ (Queen Sri Patcharin Military Base) and then taked to the detention jail in Muang Khon Kaen police staion. Pol. Col Wiset Pakdewut, Inquiry Official from Khon Kaen Police Station summoned 7 student activists to report at the police station to acknowledge the charges within 17.00pm, but they failed to answer the summons. Moreover, On that morning at the Democracy Monument in Khon Kaen, there were student’s organisation from the north,e central, north east, south of Thailand and 20 villager’s organisations reading a statement on “New Democracy Movement”. They offered a principle of “ Democracy-Human Rights-Justice-Participation-Non violence method” asking to stop drafting a constitution for prolonging military power, to return the power to the people by election, to respect human rights and to let communities to participate in the social problems. After that, approximately 15.00 pm, 7 student activists of Dao Din Group announced at Chamchuri Court in front of the Faculty of Law, Khon Kaen University that they were not going to report, not escaping and willing to accept the consequence of law by saying that the law that enforced in this caw was not legitimate. Thus, they were saying that this was an act of civil disobedience. On the last day of extending the period to acknowledge the charges, 7 student activists announced that they were not going to answer the summons and what they were doing was an act of civil disobedience. Meanwhile, they posted ‘a statement from our 7 Dao Din’s heart’ on Facebook page-“Dao Din Samanchon” saying that they were readied to be captured at Loei province. The reason for choosing Loei was because Loei was the beginning of them. It was the first place where they learned to fight with the villagers (anti Loei gold mining). And, they knew that they would be captured eventually so they wanted to be at Loei. In the movement of fighting against injustice and inequality in this society, they knew that eventually they were going to be captured. So they weren’t begging from either NCPO’s government or tyrant capitalist to give them freedom but they wanted to guarante freedom, human rights, democracy, participation, justice, peace by themselves. After having been released on bail from distributing “Vote No” documents in market at Phu Khiao, Chaiya Phoom Provimce, Jatupat was seized to 23rd Military Circle Court, Queen Sri Patcharin Military Base, Khon Kaen or Khon Kaen’s military court. Then, the military prosecutor issued an order to prosecute Jatupat. Before this, Khon Kaen’s military court had issued a warrant of arrest on Jatupat in 13 June 2015 for defying the Head of NCPO Order no. 3/2015. Prachatai referred to a report from Thai Lawyers for Human Rights that Jatupat had been brought from Phu Khiao Prison to Khon Kaen’s military court at 19.30 pm. However, Jatupat’s parents weren't allow to follow Jatupat or get inside military base so they had to wait outside. At 20.30 pm, military prosecutor presented and issue a prosecution order on Jatupat. After that, military court accepted the case and ordered Jatupat to be remanded. Thai Lawyers for Human Rights reported about unusual judicial proceedings that the court accepted to hear the case of Jatupat after working hour. Military prosecutor explained the necessity of entering a charge of Jatupat after normal working hour to the court that there was obstacle on travel path. He explained that he had contacted the inquiry official to bring Jatupat at 13.00 pm to file a case to the court. However, the far distances cost a lot of time and that was why he had to file a charge against Jatupat late. Jatupat’s lawyer file a motion to revoke an unlawful proceedings on 19 august 2015 to military court. The lawyer explained that the court accepted the charge after office hour was against the judicial proceeding. Peace TV’s Facebook page reported that Khon Kaen military appointed Jatupat to submit his plea. Before the testimony, military court inquired the motion that Jatupat’s lawyer file to the court to dismiss the case because he saw that this case was conducted under unlawful proceeding-entering a charge of after office hour. Military prosecutor stated to the court that before entering a charge on 19 august 2016, he had coordinated with the police and the court that he would brought the defendant to court at 13.00 pm. However, there were traveling obstacle on the path that cause the problem. After examination, the court dismissed the motion from the defendant because there was really a coordination between the prosecutor and the court so this was a continuous act to prosecute the case to the court. Moreover, there wawn’t any prohibition to enter a charge after office hour so the case could continue. After the court ordered to dismissed the defense motion, the court inquired Jatupat. Jatupat denied all allegations and filed a request for bail with 10,000 baht cash. The court released Jatupat on bail and set a schedule on evidence examination on 27 October 2016. The Issan Record reported that the military porsecutor informed the court that he needs to bring 5 witnesses to testify including the officers who were presented at the scence and the inquiry officer. The defendant has submitted 4 witnesses to testify which are Jatupat himself, Angkhana Neelapaijit a National Human Rights Commissioner and two lecturers from Chiang Mai University. The military court then scheduled to examine the first witness on 30 January 2017. Jatupat was detained in Khon Kaen prison after his bail contract was revoked by the order of Khon Kaen Provincial Court in the case under Section 112 of the Crimincal Code for sharing a BBC Thai articile. The Khon Kaen military court scheduled to examine the first witness but the court cannot have Jatupat to be presented for the trial. Khon Kaen Provincial Court has submitted a letter to military court informing that Jatupat was under the jurisdiction of the provincial court for the lese majeste case and it did not allow to take Jatupat because in there is no information of the case under military court report from inquiry officer. The Khon Kaen military court then scheduled a new witness hearing on 27 March 2017. The first witness, Col.Surasak, a military officer who was present at the scence has testified. Khon Kaen military court postponed the witness examination in the case of Jatupat ‘Pai Daodin''s alleged defying of NCPO Order No. 3/2015 (on the ban on public assembly) to the 20 November 2017. The postponement was due to the absence of 2 eye witnesses: a news reporter and a police officer. In the case of the former, the court issued the warrant to an incorrect address while in the case of the latter, the location of the witness's work office had changed and the warrant was sent to the earlier address. The court asked the military prosecutor to issue the warrants to the updated addresses. The court also accepted a motion from the military prosecutor to amend Jatupat's indictment to add his current and prospective sentences (if found guilty) together, instead of calculating them as concurrent. The defense lawyers objected to this motion as it disproportionately advantages the military prosecutor and the amendment will take place during the trial process. In addition, the defense argued that the photocopy of the detention warrant from the Khon Kaen Provincial Court is invalid as it was not certified by a court officer. After considering the arguments of both sides, the court judged that the objective of the military prosecutor's amendment motion is to inform the court about the dates of Jatupat's detention/imprisonment. This is for the court to determine Jatupat's sentence in accordance with Article 22 of the Criminal Code. The court also dismissed the defenses' argument that the motion disproportionately advantages the prosecutor over the defendant. The court judged that the motion does not affect Jatupat's ability to defend himself. The court also dismissed claims of the invalid photocopy of the warrant as it confirmed that the representative of the director of the Office of the Khon Kaen Provincial court has certified the document.